I grew up in the generation after the golden age of manned space exploration. I never watched the Moon missions. I never held my breath as humanity first ventured into space. Was that terrifying to watch on television? Certainly the drama in events like the Apollo 13 mission must have been electrifying. But the explorers of my generation are primarily robots: intrepid Martian rovers and lonely orbiters. Landers on comets a hundred million miles away. We see new vistas, certainly, and dream big dreams, but the human element is often somewhat lacking. It doesn’t necessarily have to be this way, Europa Report eloquently demonstrates. This low-budget, independent science fiction movie illustrates two things. The first is how close the high drama of true human discovery still waits beyond the horizon. The other is that it doesn’t take a studio powerhouse to bring this to life. 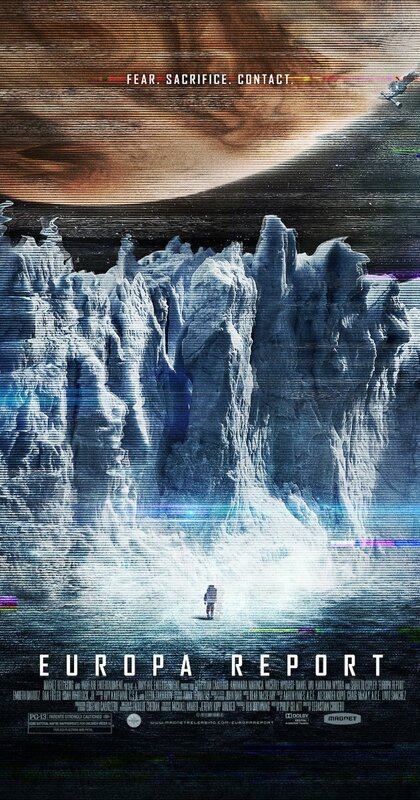 Europa Report is a story set in the near future chronicling the first manned mission to Europa, one of Jupiter’s large moons and today in truth assumed to be the most promising location for finding life in the solar system. The story is told in the form of found footage and interviews, a bricolage of believable glimpses into the life of the six astronauts living aboard their vessel on its twenty-two month voyage to Jupiter. They have been sent because scientists on Earth have (again, very believably) found strong evidence for the possibility of life on Europa. A private venture has funded the mission—humanity’s first voyage into deep space since Apollo—to ascertain whether or not there are microscopic organisms living beneath the moon’s icy surface. The story is believable enough that at times I had a hard time separating the science from the fiction. It’s an image of a possible very near future, and there’s no wildly unbelievable piece of technology or contact with alien intelligence that pushes this movie firmly into the realm of the unbelievable. This could be us in a handful of years. There’s great effectiveness in this narrative humility. No epic story arch. No shaking camera angles. No impressive and overwhelming CGI explosions. This is a story about simple wonder and exploration—and that it’s never quite that simple. Soon into the story it becomes apparent that something has gone wrong. One of the astronauts is killed, and the mission loses contact with Earth. The pieces are filled in as the story continues, but the survivors are faced with deciding whether to carry on and complete the mission. How far are they willing to go, they must ask themselves several times throughout the film, in answering the question of whether life exists elsewhere in our solar system? You’re not going to find killer aliens or stark insanity or creeping terror here. This is not a psychological space-horror or Lovecraftian tale of unfathomable alien intelligences. There are certainly moments of terror, yes, and an effective story that keeps you guessing until the very end. (There’s a particularly effective twist that upends what you think you’re seeing and who you think survives near the end of the movie that’s expertly done.) The backdrops to the action are the ominous, gorgeous approach of Jupiter through the ship’s windows as the characters continue their voyage. It’s awe-inspiring in a slow, subtle way, a reminder of just how huge these objects are, how vast the distances, how audacious the hubris to venture out on that emptiness. I loved Europa Report because it was simple. It was a terrifying and exciting drama of discovery against the immense and unforgiving background of space. The cramped confines of the ship were held in a steady, tight contrast with the emptiness through which they traveled, and these were both balanced against the bleak vista where one might find life sheltered against the void. The actors (no big names that I recognized) played the role not of heroes or villains but explorers, with all the shades of heroism and failings that this entailed. The ending left the door wide open, not in the sense of dangling more mysteries to spin out a sequel (there was definitely resolution) but in the way that the sky remains open: there is more to discover. There is much more to know. In this respect, Europa Report felt like a throwback to the golden days of science fiction in the very best way possible. This entry was posted in Reviews and tagged Europa Report, exploration, movies, review, science fiction, space on November 13, 2014 by boldsaintcroix.